Following folklore, March in Greater Moncton did indeed come in like a lion and went out like a lamb. 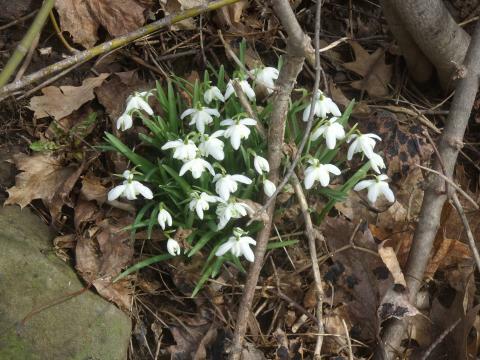 The first few days were cold and snowy but then something unusual happened – a 16 day stretch of virtually no precipitation – odd for any month of the year especially March. The only real chill was a brief period near month’s end which was actually the coldest time since early February. An exceptionally mild winter has led to a virtually ice-free Gulf of St. Lawrence according to Environment Canada. The Gulf normally has about 43% ice coverage during the winter but this year only 7% of the water was frozen over. The 7% ice coverage in the Gulf shatters the record set in 1969 when only 12% was covered. The news is good for most fishermen who won’t face delays getting their boats out in the water this spring. But many seal pups could die this year as their mothers turn to land instead of ice floes to give birth which means pups are falling prey to coyotes, eagles and even humans. The US Northeast continues to get pounded by heavy rain with rainfall totals since Monday reaching 50 to 100 mm across a large area from eastern North Carolina to Maine. Around a dozen daily rainfall records were broken across this region Monday. This is already the wettest March on record for Boston, Providence and New York City. 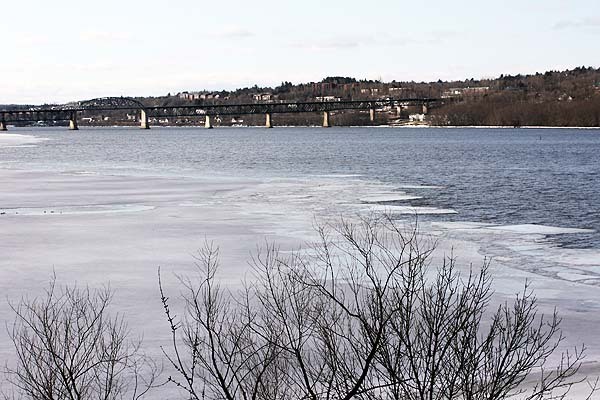 Mild temperatures, snow melt and rainfall forecast over the next 36 hours, will cause water levels along the St. John River to increase, causing the break-up and movement of existing ice that could result in ice jam formation and localized flooding. Bulletins are normally issued daily during the spring flood season. 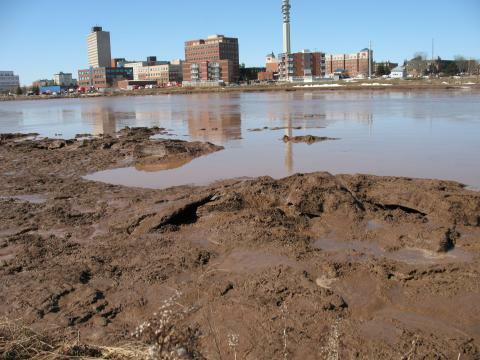 This year’s season is expected to be less severe than past years due to below normal snowfall amounts in New Brunswick this winter. Thanks to a strong El Nino which dropped the polar jet stream further south, Florida has endured its coldest winter in 30 years. During the Sunshine State’s winter of discontent, tomato crops were killed, tropical plants turned brown and died, iguanas dropped from trees, pythons perished and manatees washed ashore in chilly ocean waters. Tourism also suffered as temperatures plummeted to low single digits Celsius as far south as the Florida Keys. But the citrus and berry crops may have actually benefitted from the cold by bringing out the sweetness of the fruit. Spring officially arrived in Greater Moncton at 2:32 PM Atlantic Time and it did so in fine style – breaking a record. The thermometer climbed to 13.4 C beating the old record high of 11.7 C set in 1975. The hotspot in New Brunswick was 18.6 C in St. Stephen followed closely by Grand Manan at 18.4 C.
Kejimkujik Park in Nova Scotia was the warmest spot in the country today at 20.6 C! Could the groundhogs have been wrong? Are we really having an early spring in Greater Moncton? 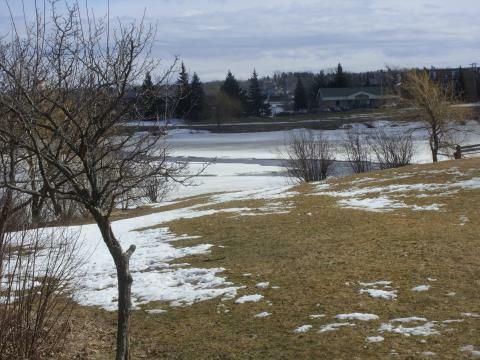 A recent mild and dry stretch of weather has virtually melted all of the snow (with the exception of snowbanks) and the temperatures continue to climb. Moncton reached 9.4 C today (the record is 13.5 C set in 1984). Fredericton and Miramichi both hit 14 C and the hotspot in New Brunswick was Bathurst at 15 C! 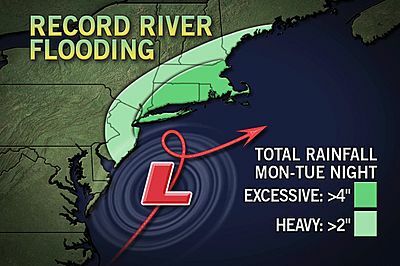 A torrential rain and windstorm downed trees, flooded roads and knocked out power over a wide swath of the US Northeast from Pennsylvania to New Hampshire on the weekend. New Jersey may have been the hardest hit state where the governor declared a state of emergency. 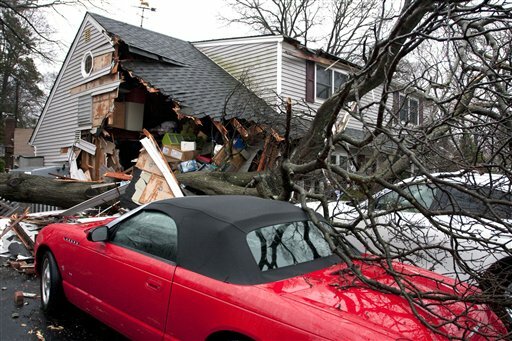 Nine storm-related deaths were reported and up to a million people lost power. The storm eventually moved out to sea and had only a minimal impact on Southwestern Nova Scotia. 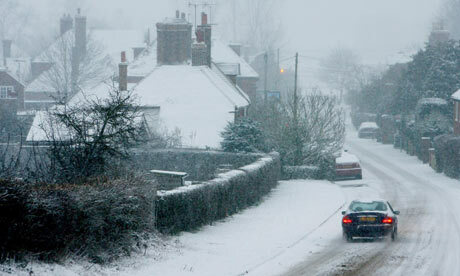 After snow, rain, sleet, rain and consistently freezing temperatures, the UK Met Office has confirmed the winter of 2009-10 was the coldest in 31 years. The UK winter ‑ which in forecasting terms lasts from the start of December until the end of February ‑ has been the harshest, in temperature terms, since 1978-79. According to the Met Office, the mean temperature in the UK was 1.51 C this winter, compared to a long-term average winter temperature ‑ from data between 1971 and 2000 ‑ of 3.7 C.
The mean temperature in 1978-79 was 1.17 C.
Scotland suffered the most this winter, with the provisional mean temperature 0.24C ‑ only slightly higher than 1978-79, when the figure was 0.16C. England, Northern Ireland and Wales were warmer, although temperatures of 2.12 C, 2.05 C and 2.09 C respectively could only be considered mild by comparison with the Scottish figure. Environment Canada says much of the nation had temperatures which were as much as 4 C above normal and well-below normal precipitation during the recent meteorological winter (Dec,Jan, Feb). 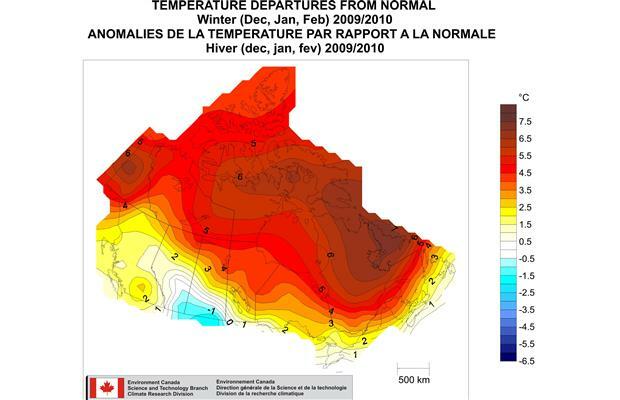 It was the warmest and driest across Canada since 1948 when national record keeping began. A strong El Nino is being attributed for the warmth which pushed storm systems and colder air much farther south this year causing colder and snowier weather than usual in the U.S. In Greater Moncton, winter temperatures were 3 C above normal and snowfall is so far running well below normal for the season (averaging 220 cm as of March 11th, the normal for the entire season is 350 cm).